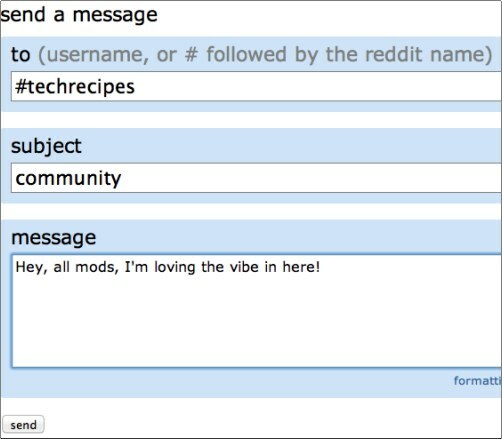 When sending messages within reddit, a very cryptic message appears: “send a message to (username, or # followed by the reddit name).” What does this mean and what does it have to do with reddit moderators? Keep reading to discover its power. Although a lot of people enjoy killing time on reddit, the real power is from the smaller subreddits. Many of these are unique, niche tight communities were real friendships and relationship are developed. To keep these subreddits focused, moderators have to work hard to keep the discussions on track. What the heck does that have to do with this craziness when trying to send messages on reddit? By prefacing the number sign (or pound sign or hash key) before a subreddit’s name within this comment box, you will message all the moderators of that specific subreddit. So if you send a message to #techrecipes, all the moderators of the techrecipes subreddit will receive the message. Here is the message being sent. Here is what the moderators see. So now, if somebody is abusing your favorite subreddit community, you can notify the moderators.